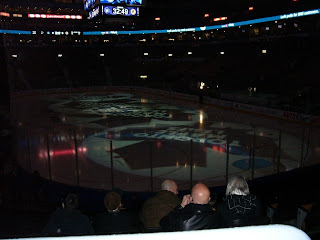 At Christmas JB and I received Maple Leaf tickets for Jan 3/11 vs the Boston Bruins from my Mum and Thom. We had a super time and I was able to get to ice level not far from our seating (in the Reds) pre game to get some photos of the players. Now I am not a super photographer even in this day and age of digital. I get so excited that I just start clicking. 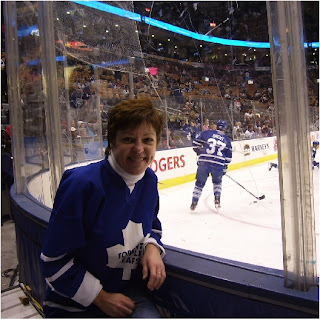 Thanks to a young lady who was at ice level beside me we helped each other and her first game she wanted me to take a pic of her so I did and she obliged me the same. Here I am sporting my Leaf jersey, wootwoot. 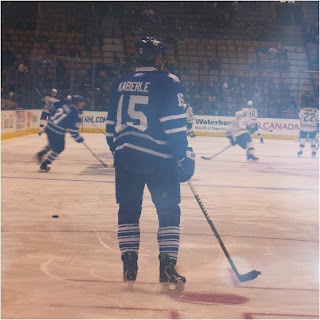 And below here is Thoma Kaberle #15, the glare is from the plexiglass that was in front, we don't want to get hit by flying pucks now do we? so this is why there is a bit of a glare. I was able to tone it down a bit. 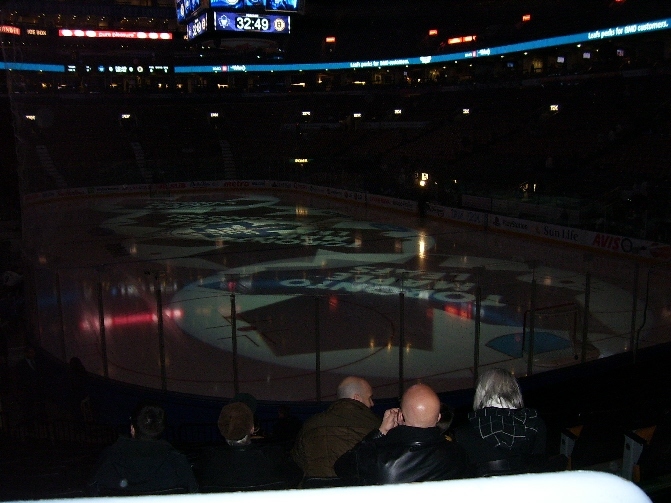 And this is just before the game when they turn the lights down and the players are ready to take to the ice. We scored the first goal but, unfortunately Boston won 2-1 but the Leafs a struggling young team sure played a great game. Thanks Mom and Thom this was so special and we had a great time. And this last pic has nothing to do with hockey. 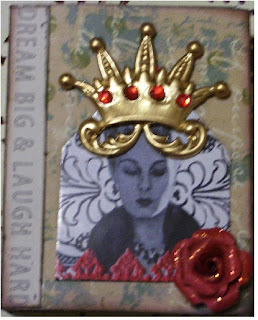 This is a matchbox I made from a template and decorated over the holidays. I never seem to be able to sit still for very long and I enjoy making these little boxes then filling them with goodies like art bits that I have in my stash. Over the past few years I have made and traded a few and really enjoyed the different art interpretations on various themed swaps. This box is our mascot over at the newly formed FlickR group Matchbox monthly swap I set up for 2011. We are going to have monthly themed swaps so if you would like to join us just click on the link and if you don't already have a FlickR account, it is free. FlickR is a great venue for free images, swap groups and much more. If you notice on this matchbox I have one of my paper roses. I now have a template I can use with my Cuttlebug to cut out my flower shapes then make my roses much faster than trying to hand cut each flower. The image is an Artchix image mounted on a small house shape chipboard shape and the crown is from Artchix as well. Thanks for stopping by and keep watching for more creativity this year. I hope you all rang in the New Year with fun and new resolutions. Lovely box. So glad you had so much fun at the game! What fun! You look great in your new hockey jersey! Love your blog template, so cheery! Looks like you had alot of fun at the game..nice jersey!! and the Matchbox is gorgeous.. have only done a couple but did have fun with them.. and your blog does look great.. have a great sunday..